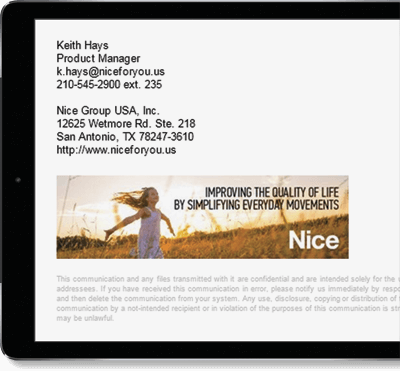 Signatures for Office 365 Case Study - Nice Group USA, Inc.
Case Study: Nice Group USA, Inc. Founded in northeast Italy in 1993, and with multiple offices worldwide, the Nice Group is one of the major international names in the home automation industry. It is renowned for designing, manufacturing and marketing automation systems for gates, garage doors, road barriers, awnings and shutters for residential, commercial and industrial buildings, as well as wireless alarm systems, combining technological innovation and design to offer products that are extremely simple-to-use. Nice Group USA, Inc. is one of the organization’s major R&D Centres in the USA. Based in San Antonio, Texas, it had been utilizing Office 365 Transport Rules to manage all of its users’ Office 365 signatures, a standard practice within many companies on Office 365. Even though the US office is relatively small when compared to other global Nice Group locations, the IT department had been struggling to manage email signatures effectively. Email signature templates not working correctly in Outlook, too many complex Transport Rules and problems implementing signatures on Macs had caused too many lost IT admin hours. It was clear that the organization had to rethink its email signature management strategy and invest in a third-party solution to mitigate all of these issues.